Our sister company; Mediawerx is currently working on a short film titled "Lost In Transition" about a small robot that is created and then begins exploring the world around it. The robot was acquired for study, here at Scriptwerx which gave us the idea to create a little film about it - keeps us all busy and it's really fun. It's really great when our two companies can be combined like this; reminds us of the old days when we'd be creating video content and rich, secure, online applications to play it. 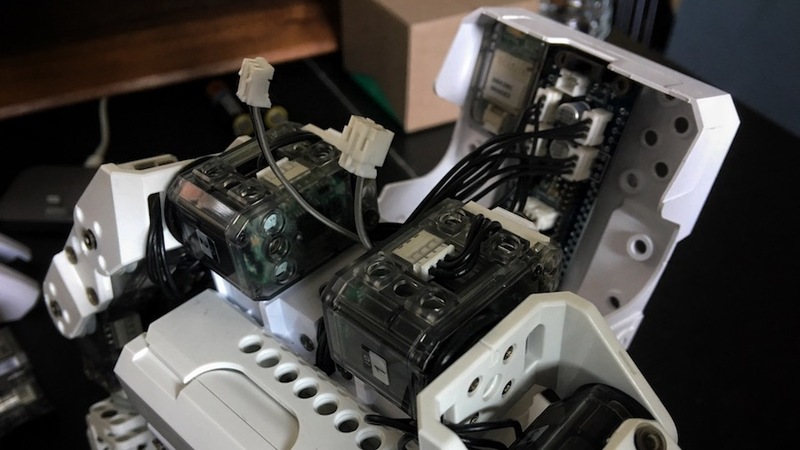 The robot we're using is based on the Robotis Mini which is powered by the OpenCM 9.0.4; an ARM Cortex-M3 based embedded controller and DYNAMIXEL XL-320 actuators. The basic Robotis Mini is configured to use 16 DYNAMIXEL XL-320 actuators with a dummy, posable actuator for the head. The film requires the illusion that the robot has somehow come to life and is exploring the world around it - this was not accomplishable without animating the head. We'd ordered an additional DNYNAMIXEL XL-320 and this evening we got around to getting it up and running and fitting it into the robot. 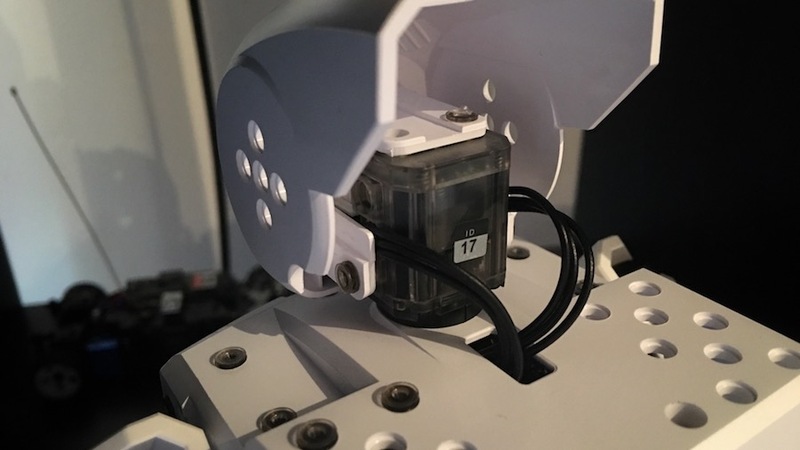 We had to remove the top of the robot, disconnect the OpenCM 9.0.4 and replace the dummy actuator with the real one. Before this; we needed to change the XL-320 ID to #17 so that it can function correctly as the head. We did this by disconnecting the OpenCM 9.0.4 board and connecting only the new actuator and changed its ID to 17 using the d_Dxl_ID_Change sketch within the OpenCM editor. We also applied the ID 17 label supplied with the Robotis Mini kit. After successfully changing the ID and testing everything was fine with the current configuration, we restored the OpenCM 9.0.4 firmware back to default using R+ Manager. We then reassembled the robot with the new head actuator linked via the ID #8 actuator. The cable here is quite short but it's sufficient in order to get a reasonable degree of turn for the head. The robot can turn its head almost 90 degrees to the right but only about 45 degrees to the left due to the restriction of the cable length. Ideally we would have changed this but that would have required much greater disassembly of the robot and this amount is fine right now. 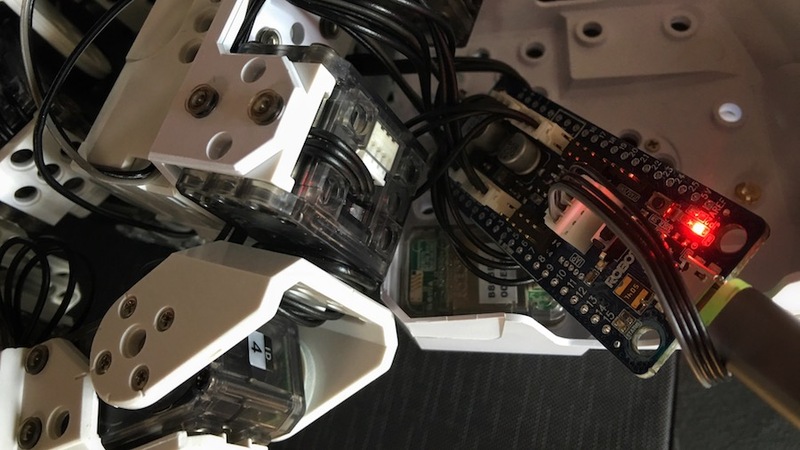 We plan to add sensors to the robot in the near future and will update the blog accordingly.